Wiltshire lies in the south of England and is the hailed as the gateway to the West Country. 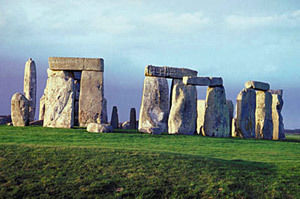 The county is popular for its three major attractions, Salisbury, Stonehenge and Longleat. While these three are all exceptional places to visit there is plenty more to discover in this historic county. Wiltshire is said to be the home of Britain's very first settlers, the Beaker Folk, and the whole area is packed with ancient archeological and heritage sites. Stonehenge, one of the world's most important neolithic sites, was designated as a World Heritage site in 1986. Its magnificent standing stones draw-in over a million visitors each year. Salisbury, located in the flat plains to the south, is one of Britain's most important and historic cities. The 440 ft tall spire of it's cathedral can be seen for miles around. The whole county of Wiltshire is undeniably a pretty area of rolling green hills, with over forty percent of it classed an area of Outstanding Natural Beauty (ONB). The area includes the rich arable farmland of the Marlborough Downs and the southern section of the Cotswolds. The south and east of Wiltshire is mainly rolling chalk downs. The north-west lowlands are predominately meadow dairy land, producing milk and cheese, from which comes the saying 'As different as chalk from cheese'. Two thirds of the county lies on chalk and its inhabitants have used this canvas to carve white horses on the hill sides for centuries. These horse shaped symbols have today become the county's unofficial emblem. Lardy Cake - a traditional rich spiced form of bread made with freshly rendered lard. Wiltshire Porkies - tasty battered skinless pork sausages. Wiltshire ham - scored and roasted with a local honey, mustard and sugar coating. Bacon Fraise - Fried bacon covered with egg batter. A breakfast dish that dates back to the 15th century. First recorded in 878 as Wiltunschir. Named after the West Saxon settlers known as the Wilsaetan who lived along the Wylye valley.